You already know that Mathews Ford has new cars. But did you know that we have one of the largest used car inventories in Sandusky? We have got hundreds of pre-owned models, including Mathews Ford Certified pre-owned cars, trucks, and SUVs! When shopping with Mathews Ford, you can own new car peace of mind at used car price! Keep reading to see all the benefits of buying Mathews Certified! Every Mathews Ford certified pre-owned vehicle undergoes a rigorous 172-point inspection to ensure top quality. Plus, your certified pre-owned vehicle is covered by our limited warranty coverage! This includes a 12-month/12,000- mile limited warranty and a 7- year/100,000-mile powertrain limited warranty. That's in addition to a 24-hour roadside assistance and a vehicle history report on every vehicle less than 6 years old and with fewer than 80,000 miles. Plus, even if you don't buy a Mathews Certified vehicle from us, we could still buy your current vehicle! It's clear to see why you should buy your next certified pre-owned vehicle here! We have been family owned and operated for almost 40 years, and know how to treat our customers. That is why we have introduced Mathews Certified, so you can rest assure your pre-owned vehicle was meticulously inspected and reconditioned to the highest standards. 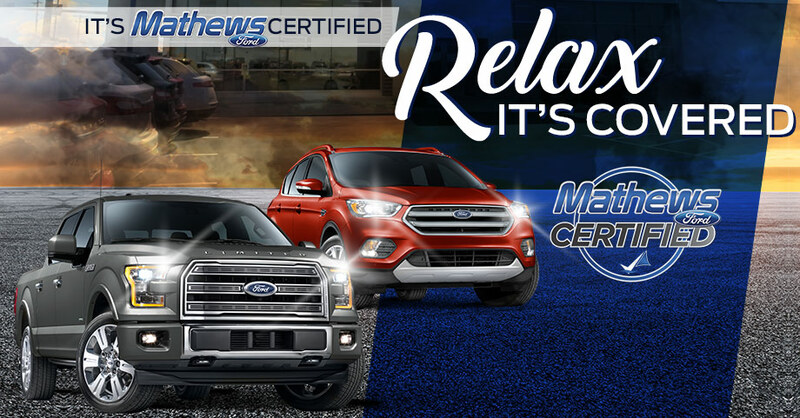 Hurry in to Mathews Ford and test-drive a certified pre-owned vehicle today! When You Make it Mathews, We Make it Happen!